Just about every food industry furnishes some byproducts, byproducts that we decided to feed to livestock. I just finished reading a 12 page article titled “Byproducts as Feed for Livestock” from the USDA Yearbook 1950-1951. I didn’t know these existed until I finally quit searching for any literature that would educate me about corn’s history with cattle; I had to call my good friend and mentor, John Flatberg who led me to the Yearbook. “Corn gluten feed, corn gluten meal and hominy feed are widely used in livestock feeding.” or how about this snippet… “Although not so high in protein as the oil meals, such as linseed oil, soybean, and cottonseed, distillers’ grains rank well in feeding value. Fed on an equal protein basis, there usually is little choice. Tests by the Nebraska Agricultural Experiment Station, for instance, have shown this to be true in the feeding of soybean meal and distillers’ grains to fattening cattle.” It was all just one big experiment but check this next section out… “The more important animal byproducts used in feeds are tankage, meat meal, meat and bone meal, blood meal, bonemeal of several types, liver meal and glandular meal. Meat scraps, trimmings, offal, and the rejected carcasses are sometimes cooked with steam under pressure in closed tanks to separate most of the fat. The watery portion is removed and concentrated, and returned to the solid portion, which is then dried and designated as tankage.” umm… What?! That seems crazy to me. Oh by the way the definition of tankage is a fertilizer or animal feed obtained from the residue from tanks in which animal carcasses have been rendered. In case you didn’t know, I didn’t. During these experimental years where the ‘system’ was becoming more ‘efficient’, (you’d probably be annoyed at using two air quotes in one sentence), something unique began happening and still continues until today. As mentioned above, we began to think of food largely as nutrients instead of food. This is how the nutritionism baby was born and this is how a corrupt food industry was able to penetrate the mouths and minds of Americans. That all sounds fantastic! Doesn’t it? A committee dedicated to exposing harmful practices and substances, a committee dedicated to giving the people the truth we need… Well the meat milk, and egg producers were very upset and they weren’t the only ones. The President of the Salt Institute fired back as a result of The Report as well. “To summarize the position of the Salt Institute, we feel that there is definitely no need for a dietary goal that calls for the reduction of salt. “Degenerative diseases inevitably accompany old age. Indeed, health care expenditures increase if the lifespan is prolonged.” The argument that people live longer because they eat healthier could end up being more expensive. Dr. John Cairns pointed out that “If tobacco were banned from the United Kingdom, the increase in the expected lifespan would simultaneously increase the cost of old people, which comes under the category of healthcare expenditures. If people eat healthier, we might have more old people to take care of.” Doesn’t that quote alone make you wanna live to be 100?! Of course they would think the professional community and food industry should have a say in what the dietary guidelines are, nobodies interested in the truth just their bottom lines at the expense of the very people supporting them. How’s that for customer appreciation? Wouldn’t that be the same as suggesting the chickens should play with the coyotes? The two industries that had the biggest problem and thus caused the most friction were the meat and egg producers. The meat and egg producers requested additional hearings to express their views. The Indiana Egg Council: “by unanimous action request your assistance and cooperation in stopping immediately the distribution of the highly controversial report “Dietary Goals.” The frightening development as far as the egg industry was concerned is that the advocates of a modified, low-cholesterol diet now have the credibility and the prestige of the U.S. Senate as an endorser.” This statement was made by the United Egg Producers and fifty-six other egg industry organizations to the committee, July 26, 1977. The President of the American National Cattleman’s Association described why they reacted rather violently… “In “Dietary Goals” meat is never mentioned in a positive way, another oversight of the report. The only mention of meat are those associating meat consumption with various degenerative diseases. If these “Dietary Goals” are moved forward and promoted in the present form, the American public and its medical-health advisors will be misled in quest for better health. Entire sectors of the food industry—meat, dairy, egg, sugar and others—may be so severely damaged that when it is realized that the “Dietary Goals” are ill-advised, as it surely will be the discovery, production recovery may be out of reach. It is clear that this report and its recommendations must not be promulgated further.” I’ll throw my 2 cents in, a sick cow cannot be good for human food. You’ve probably heard the quote “you are what you eat but you’re also what you eat ate.” If a cow is suffering because a rumen is meant to digest grass and turn that into natures balance of nutrients then doesn’t it make sense that two pieces of meat could be completely different in their ability to nourish? It makes sense to me. The Senate Select Committee on Nutrition should withdraw its recently issued “Dietary Goals” publication and should issue a correct report. We concur with the Senate reorganization plan calling for elimination of this committee and incorporation of its functions into the Agriculture Committee. Well the problem was The Agriculture Committee looks after the producers of food and not the consumers. The Committee responsible for the attempt to actually help Americans was disbanded after this and the guidelines were no more. Ever since this report we’ve been forced to talk about nutrients instead of whole foods because talking about whole foods attacks a certain industry. I’d imagine it was as confusing as it is today; I can see it now… Mary Beth and Velma are in the corner store when they strike up a gosh darn good conversation. Velma says to Mary Beth “Well gee golly Mary Beth, I read that butter is bad.” “Isn’t that just too bad Velma?” says Mary Beth. “It sure is, but guess what?! They’ve come out with margarine! It’s better and it has less fat! Also, they have these new tv dinners that are precooked and packed full of protein, vitamins and minerals and all I have to do is throw it in the microwave and dinner is served!” It became cool to colloquially throw out the fact that you were purchasing this processed food because it has less saturated fat or was loaded with vitamins etc. How did they know? The box told them and it was backed by science! Wow! The problem with this now is that beef is beef or protein is protein and all tomatoes are created equal and eating one tomato grown in the best soil on earth that has never been sprayed with herbicides and pesticides is just like eating a tomato grown in a field of rocks void of life but rich in nitrogen inputs and chemicals. It’s all the same which couldn’t be further from the truth but our minds don’t ask all these questions because we’ve become so accustomed to just going to the store and trusting these gigantic corporations with million dollar marketing plans. Any product that is crappy has to have a million dollar marketing strategy. Ever noticed how great products usually sell themselves. Pay attention. The industry invaded our kitchens and it was new way of thinking about the meal. A Bar 10 Steak has this much protein, these minerals and vitamins and this amount of fat all in natures balance but to most a steak is a steak and a grass-fed steak is gross and for sissy’s. Never mind how it actually got to your plate. A protein bar that was created to mirror everything that steak had is now just as nutritious. False. Look where that logic has gotten us. Sicker than we’ve ever been, more confused than we’ve ever been and more dependent than we’ve ever been. Red meat is over consumed, no doubt about it but that’s only half the problem. The other half, in this instance, is that its red meat that is sick and just about to die right before it’s butchered but barely kept alive long enough in order to reach a certain weight by heavy doses of antibiotics from the unnatural diet they’ve been on for the last months of their lives and that’s the red meat we’re eating, that’s why it was and has been bad for human consumption since the 1950’s and that’s why it was part of this report. Red meat from a solid and honest rancher who is raising animals the right way; on green grasses and open pasture, with no hormones nor antibiotics is going to have natures balance of nutrients and can be very healthy for humans. 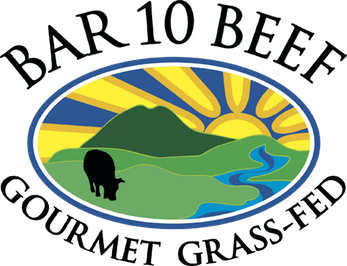 Not to mention that it’s eating grass, in Bar 10’s case, our grass is testing at brix levels of 24! That means there is a very high mineral content in our soil which means our soil is alive and well. Even this health product can be overeaten. It’s ironic that being involved in selling beef i’m writing to tell people to not eat so much beef. I’m not wrong, i’m honest. We should eat much less red meat but the red meat we do eat should be from the best source possible. Bar 10 Beef is the best source. If McDonalds purchased beef from us it would cost the consumer a little more but overall we’d save taxpayers 3.85 Billion Dollars on Big Macs alone. The grass-fed beef market has grown 100% annually over the past 5 years compared to grain-fed beef which has only grown 7%. The grass-fed market however is still only 7% of all beef sales in the United States but it’s expected to be 30% in the next 5 years. Grass-fed is on the rise because consumers are becoming more educated and conscious in their food choices. 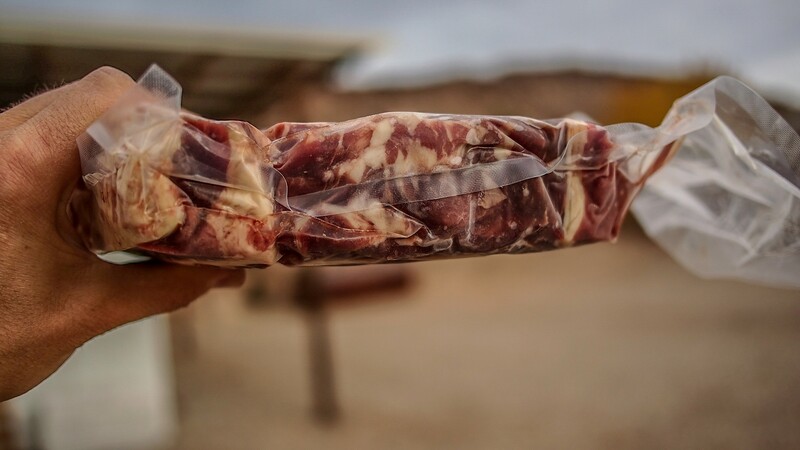 This means there are going to be, and has been, a lot of ranchers who take any cow and throw it on any pasture and direct market it to you in desperation to chew up a portion of the increasing “grass-fed” market. Genetics matter, soil matters, weening age matters, grass varieties matter, it all matters and it all takes time and dedication. Just because a package says “grass-fed” does not mean it’s a product you should be digging deeper into your pockets to pay for. You’re investing in your health now as opposed to later, right? If all cattle were raised like they were in the time of your great grandparents than meat wouldn’t have been apart of that report. Let’s walk through some history. The ideal wasn’t too far in the past, for some it was a grandparent that knew a rancher raising what he could, on grass alone, because grass is all cows have ever eaten. Michael Pollan, named one of Time Magazine’s 100 most influential people after writing books like The Omnivores Dilemma and In Defense of Food said this in an interview with PBS “ Well, a cow out on grass is just an incredible thing to behold... Cows and other ruminants can do things we just can't do. They have the most highly evolved digestive organ on the planet, called the rumen. And the rumen can digest grass. It takes grass, cellulose in grass, and turns it into protein, very nutritious protein. We can't do that. We can't digest grass. So to take land that is not good enough for agriculture -- that's growing grass and nothing else, that's been doing that for 10,000 years since the buffalo -- and put a cow on it ... there's something beautiful about that, and it's just the way it was meant to be.” By the way corn finishing an animal might sound cool and someone may make it seem like it’s cool and what needs to be done but in reality it’s changing the entire fat composition of that animal and in most cases it’s purely for higher yield… more money, not more nutritious. A rancher in the past would peddle his products, usually milk, cheese and beef, to locals. That was the only option he had before railroads were built. Those who supported him by consuming these products had a relationship with him, they knew how he was raising the cattle, they knew how he made the cheese and harvested the milk and they knew what type of man he was. It was always in the ranchers best interest to keep his soil healthy, treat his animals well and it was also in his best interest not to overgraze the grass just to put on a few extra pounds per animal. Over grazing would take from the following year and uproot a system that has been well established for decades if not centuries. By uproot I mean literally pull the grass roots out of the ground which damns the trillions of symbiotic relationships that were in place in order to move nutrients and minerals around in the unseen world we call dirt. They would try to rotate the cattle in order to mirror a natural pattern of grazing, pooping and moving along. This natural pattern fed the cows, fertilized the soil, moved the cows along so they didn’t over graze and brought them back to the section of land when it was ready. In addition to this way of life the fact is that cattle were still largely pure bred. Their genetics were built to fatten on grass alone, supply enough milk for a calf and maybe a little extra. 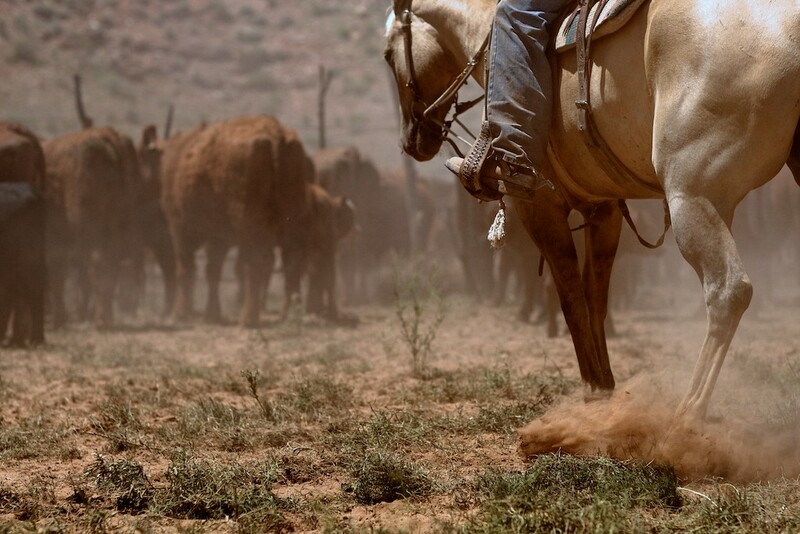 The way things are done now have sped up the lifespan of a cow and turned most ranchers into cow-calf operations. Once the calf is weened off mothers milk it’s shipped to a backgrounder or sometimes straight to the feedlot. The goal in both cases is to fatten it up as fast as possible on a heavy diet of corn and whatever else works, like you read above; byproducts of all sorts. When a calf is weened too early it doesn’t allow their rumen to properly develop. The industry average is right around 6 months for weening. Even the most efficient and healthy of rumens will suffer and needs heavy amounts of medicinal inputs to stay alive and the industry is taking underdeveloped rumens and throwing them on corn… All I can see are problems. Bar 10 believes 10 months is a good time to ween a calf. We didn’t just pull this number out of thin air, we have a handful of mentors that have helped us along the way. Steve Campbell and Gerald Fry being two very important contributors to the success of our herd today specifically with decisions about genetics and weening but overall about everything. There has been research done, in addition to a calf at about this age seems to naturally go from a mothers teat to grazing on grass. A large part of the development of the rumen is the development of villi, which increase the surface area in the rumen allowing the ruminant to glean more nutrients. When villi aren’t present and the rumen is being destroyed by an unnatural diet the animal is receiving little to no atavistic nutrition. Cattle genetics never ever needed corn to fatten up, that’s a lie that has perpetuated the previous 50 years in order to confuse millions and habitually move a pile of corn the size of a football stadium into the pockets of few using cattle as the machines. Higher yield = more money and doing it quicker on corn made it all the more fruitful. For who? For the animal? For the people? For the environment? I’ve gone on and on but overall we’ve taken a look at a timeline dating back to the 1950’s where we gave up the kitchen in return for convenience. We’ve understood that we are obsessed with nutrients not food. We’ve seen that people will indeed do whatever they can to increase their bottom line at the expense of so many vital contributors to society, me, you, everyone, the earth and the air. We know there will be ranchers and farmers competing to take up the grass-fed market with less qualified products because we don’t ask the questions, packaging can be misleading. We’ve seen that there’re still ranchers and farmers who have come full circle to recognizing the sins of the past to once again producing fantastic products. Bar 10 Beef, Christiansen’s Farms, the entire community of Boulder, UT., Red Acre Farms in Cedar City, The Cultured Collective dedicated to educating people on fermented foods, brines, breads and beverages, even Heidi Heaton herself, my bosses wife grows an abundance of fruits and veggies every year that are so nutritious and tasty! There are options, we just have to start asking the questions and we need to read the right books, heck read any book you’d like but please have eyes to see and ears to hear. After all there are definitely conspiring men in today’s day and age. I have a list of suggestions if you’d like to get started, just shoot me an email. Rhonda i’m sorry in advance for all the errors that i’m sure are apart of this. Please forgive me. bar10beef.com yeehaw! Oh and please keep in mind that these are my thoughts and don’t necessarily represent the feelings of the Bar 10 Beef family and there is no revision process etc. Although i’m confident as all that has been stated is fact as far I can tell and feel. Thanks for reading.